FULTON, NY – United States Congressman, John Katko made a stop in Fulton during a trip to numerous Central New York locations on November 12. After visiting his alma matar at Syracuse University and before appearing at the Rally for Fort Ontario in Oswego, Congressman Katko visited the Fulton Municipal Building for a roundtable discussion on economics with city officials and local business owners. United States Congressman, John Katko. Put on by the Greater Oswego-Fulton Chamber of Commerce, Executive Director Greg Mills began with the event with an introduction of a few members of the audience including NYS Assemblyman Will Barclay, Mike Treadwell director of Operation Oswego County, Joe Fiumara of Fulton Community Development and Mayor of Fulton, Ronald Woodward Sr.
Then, to a room filled with small business owners and interested community members, Mills introduced the guest of honor, John Katko for an open roundtable discussion. “This is what we need more of. To bring people together, collaborate, rally our troops like he will in Oswego for the Fort after this. We are very blessed and very honored to have Congressman Katko here,” opened Mills. Focused on open dialogue, Katko gave a brief opening as well before allowing the audience to any address questions or concerns. In that opening, Katko brought to light an area of concern facing Congress in regards to improving economy. “There’s one thing we are working on a lot in Congress, and it’s one thing that is incredible corrosive to small business. They are regulating us to death, it’s killing small business. We are very concerned and we are fighting it every which way we can,” said Katko. Katko then went on to address a few major concerns for the are such as the current situation with FitzPatrick Nuclear Power Plant as the community just learned the news from the plant’s parent company, Entergy that they will be closing the facility within the year. With this closure, more than 600 local employees will be out of work. “Will (Barclay) and I have been working closely on this. We have had phone calls with Entergy every day,” said Katko. Further explaining that more than 600 jobs with an average salary of $119,000 would understandably devastate the local community and economy. Katko announced that the latest news in regards to this situation is that they are making sure the state and Entergy are still communicating and “that can only be encouraging,” he said. He continued to address successes within Congress such as the two year budget which Katko referred to as a “darn good one,” as well as the six year highway bill with three years fully funded that will be a part of the rebuild of 81 that will occur next year. The audience then opened up for questions or concerns beginning with an employee of Operation Oswego County urging Congressman Katko to put a good word in with organizations such as SBA and USDA to continue funding. “We have good relationships with them, they are the lifeblood of small business and I will fight hard to protect them as best as I can,” said Katko. Katko then suggested to the audience of business owners and leaders that anyone applying for grants should let Katko’s administration know of the intended application as they can then get it to the top of the list. 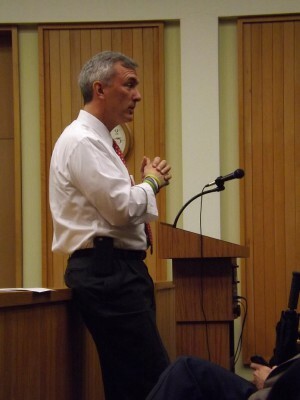 Congressman, John Katko addresses the audience at a roundtable discussion in Fulton November 12. On behalf of the Department of Labor, an audience member then questioned the funding of one-stop centers, specifically stating that they are “being strangled” and questioning if funding levels that were available in the year 2010 would be available again since the numbers have dwindled since that year, especially as over 600 local employees look toward unemployment. Realistically, Katko said these funding figures will not be restored right away. However, he believes fixing problems within the budget will happen. Katko says they’ve cut a trillion dollars of discretionary spending in the budget, but cutting from people that do not have a job doesn’t make any sense in his opinion. A greenhouse operator from outside the county then addressed the issue of healthcare, explaining her personal dilemmas with offering insurance to her employees. “Since the Affordable Care Cost, it’s a cold, hard fact that the cost of insurance has gone up. Businesses large and small are all saying the same thing,” said Katko. Katko used his personal insurance payment explaining that he pays close to $20,000 a year in health insurance now as well. However, the Health Insurance tax is a big tax, the medical device tax is both crippling the medical device industry and the ability to compete, and starting next year, the Cadillac tax will be another tax to businesses that are able to provide quality insurance to their employees, he explained. He continued to explain that state exchange co-ops were able to provide insurance at very low rates and there are already 20% of them nationwide that are belly up while the rest are quickly following suit. Legislator Frank Castiglia then addresses the 6.7% unemployment rate of Oswego County and questioned why they went all the way to Onondaga County for jobs with the inland port because he feels the city of Fulton and Oswego County need generational jobs and not just short term jobs. Katko briefly explained that the port of Oswego will be hooking up with the suburbs of Syracuse once the Panama Canal reopens so bigger shipments can come through. They will build the inland port because CSX goes right through Central New York. He explained plans to enhance the port and funding for the breakwall, saying that it will be made more of a regional thing to benefit all of CNY. The Upstate Revitalization Initiative will bring high-tech jobs to the area and will then spin off more jobs, he continued to explain. “First, we have to make sure things that are here, stay here. Second, we build on it,” Katko said. He did express his belief that Fulton was loaded with gold in the form of natural resources, plenty of land and water available cheap, and with the proper amount of tax reform he believes they will return manufacturing back to Fulton. The crowd quickly addressed the infrastructure for these resources, and how individual municipalities need money out of their pocket that just doesn’t exist to address these infrastructure repairs that are needed before any other interested parties can invest in Fulton. Katko reassured the city officials and business owners that when problems like these arise, they need to complete grant applications for both federal and state levels and contact his office so they may help in any way they can or point them in the right direction if they are unable to assist. I have been in business in Oswego County for 15 years. In that time the only thing that has gone up is the cost of doing business. Not just taxes, although these have gone up three or four times from what I paid when I did my business plan in 1999, but also water/sewer, and because other businesses are also taxed and regulated, so has everything else…plowing/snow removal twice, gasoline and auto costs, utilities and inventory. Yet, when I decided to start my business, NYS had a multi-million dollar ad campaign for women run businesses in NY. No one said, but you have to provide jobs for 6 or more employees, or you aren’t even a small business. We are too small to get anything at all. We were originally suppose to be part of the Canal Corridor project, which also dried up when we had 9/11, which was sad. But we were too small then, anyway, we found in those early months before 9/11 happened. Small businesses are the back bone of Oswego County. There are far more small businesses than large businesses in Oswego, but there is very little ‘aid’ to small business. The big boxes on the other hand, get incentives for being here, translation: tax breaks of all sorts. When you provide the nuclear industry with 8.6 billion dollars in tax ‘forgiveness’ (15 years ago?) to stay here, someone has to pay. This is passed on to the consumer who pays double. The high costs of the utilities these industries charge, as well as the double or triple taxes to make up for that lost revenue. I don’t know how you will fix this. But Mr. Katko, I wish you luck. No one wants to do without Fire/Police/city maintenance costs. But, just like the fellow who is laid off and can’t afford to paint his house, buy a new lawn mower, or pay for a plow(er), residents of this area just can’t be stretched much further without….snapping. No money to eat/health care/drive their older cars to low-paying jobs. 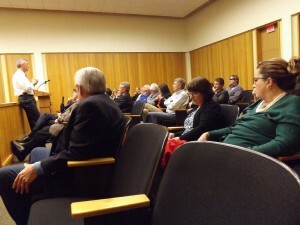 Why no common councilors in the audience? Yet there was a Oswego county legislator there.. When are the people of the 24th Congressional District going to wake up and realize that Rep. Katko says one thing when he is rubbing elbows with his constituents, and then does another when he is voting with his Republican partisans back in Washington, D.C.? When he is in his district, he touts how he is so supportive of helping the people of his district and how he (allegedly) has been able to secure funding for different projects, and yet, in the 10 months that the Republicans have been in complete control of both houses of Congress I have not yet seen a jobs bill passed and forwarded to President Obama for his signature. And yet, in that same time, they have found plenty of time to vote several times to repeal the Affordable Care Act (while offering no viable alternative of their own) and pandered to their extreme right wing by trumpeting the claims of long discredited videos concerning Planned Parenthood, which have been found to be totally devoid of any basis in fact as a result of several investigations by law enforcement authorities in at least six deep Red states. So I for one am really sick and tired of this man saying one thing when he is in his district and then doing the exact opposite when he is in Washington, D.C. And I seriously do not understand how so many people in this district do not see this as well.